Get a copy of ATFT-AppSnax to tame those holiday parties and guests! It’s my latest cookbook and features delicious appetizer and snack recipes. If you want easy, this is it. The book has two sections: no-cook/no-bake and recipes requiring heat. This book is indispensable in your own kitchen and makes a wonderful gift for the cook on your gift list! Click this image to get yours on Amazon today! Continuing the blog’s new feature: Throwback Tuesday Post (TBTP)! Every Tuesday, I re-post a past blog I think is relevant and that you might enjoy seeing again. This post was originally published on December 2, 2012, and updated on November 13, 2018. Just in case you’re not in the holiday spirit yet, know that the Christmas market is in full swing here in Bamberg, Germany, and I woke this morning to the first snowfall of the season and the scent of wood fires from nearby chimneys! Don’t forget to subscribe to this blog – or at least leave me a comment! I have learned over the years that, though I LOVE Thanksgiving in America – there’s no comparable holiday like it anywhere else – the most memorable Thanksgivings I’ve had have occurred away from home. Especially when I’ve attempted to cook a traditional meal in a foreign country – this year was no exception. 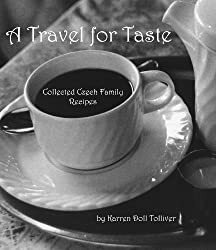 After my experience a few years ago in the Czech Republic, I knew I’d have to get an early start on finding the ingredients – or, more accurately, making them. I’ll start with the pumpkin pie, which was the biggest project by far. Although I’ve seen canned pumpkin here on the international aisle in the Walmart-like supercenter in a nearby town, there was no guarantee I’d find it on the shelves now. The bottom line is it’s no longer bike weather and it would be a trial to get to the supercenter by bus. So I decided to try to concoct the ingredients on my own. A few weeks ago I invited my friend Alycja for Thanksgiving dinner. She runs the flower shop on the ground floor of the house where my apartment is. We had to have to have it on the Sunday after the real Thanksgiving since Germans don’t celebrate this holiday. We both had to work on Thursday. Since the German word for “pumpkin” also means “gourd” or “squash” and these looked like gourds to me, I asked her if these were edible. She assured me they were “1000% edible.” Okay…. I split them in half lengthwise, scooped out the seeds and put them on a baking sheet cut side down in the oven until they were tender. I scooped out the soft flesh and used my hand mixer to puree the flesh. It turned out a little coarse -I could have used a stick blender or a food processor, but I had to work with what I had. A word about the hand mixer: as you probably know, the electrical current here is about twice what it is in the USA (220 instead of 110). This means that the lowest setting on my hand mixer is faster than the fastest setting on my hand mixer in the US! And while I’m on the subject of electrical appliances, don’t even get me started about how hot my steam iron gets! Next I had to find pumpkin pie spice. Or rather, make it. Thank goodness for the internet! I looked up the components and proportions on the web. They are mace, cinnamon, ginger, cloves, allspice and nutmeg. I had the cinnamon, cloves and nutmeg already and I just had to grind the cloves and nutmeg in my pretty little mortar and pestle. It took some research to figure out what allspice was called in German (“Piment”) and to get to the market to find it and the ginger. I never did find the mace, but I wasn’t too worried about that. I had no problems finding ground ginger, but it took about three trips to various supermarkets to find the allspice, and then it was whole, so I had to grind it as well. But the result was fantastic! It SO beat the prepared stuff in the jars from home! At first it tasted too strongly like molasses. I’m glad I made it about a week in advance because by the time I used it the flavors had married nicely. However, the wonderful cooks who post such things on the internet came to my rescue again, so I knew this was German sweetened condensed milk, which kind of looks like hand lotion or toothpaste! The turkey: I checked many places but, aside from mountains of frozen Christmas geese – the German tradition – the best I could find was frozen turkey parts, and no telling how long they’d been in the freezer. However, I’ve recently landed a contract to teach English on the local army post, the one where my husband and I lived when we were first married. Déjà vu! Anyway, the students are very sweet, and one of them offered to get me a turkey and pie crusts from the commissary (I’m not allowed to go in there with my flavor of installation pass – don’t tell our Uncle Sam). She acquired a lovely 12-pound Butterball – I think it’s the smallest turkey I have ever cooked! Since she doesn’t cook herself, she didn’t know about the frozen pie crusts and came to me with a shortbread pie shell from the baking aisle. The end result tasted ok, if you added lots of whipped cream and if you’ve never had pumpkin pie before! The German pastry dough was a little rubbery – think strudel. I’ll make it from scratch next time. Interestingly, I gave much of the leftover pie to Alycja after our dinner. She then passed some along to a friend who apparently went wild for it and wants the recipe. I’m not sure I could ever duplicate it or remember exactly how much of the ingredients I put into it! Leastways, I am betting that person won’t go to the trouble of making brown sugar and the spice mix. Not only that, but when I peeled them I discovered they had white flesh and looked for the world like regular white potatoes. Here they are on the stove. The few spots of purplish skin that were left on them turned a weird blue color when they cooked. I was a little concerned. For the stuffing, I cubed the stale baguette, made some stock from bouillion cubes, added onions sautéed in butter and the chopped turkey giblets, along with some rubbed sage, salt and pepper. I threw in some chopped walnuts and dried cranberries, too. Alycja went wild over the stuffing. Come to think of it, the Czechs liked my stuffing the best, too, a few years ago. Legend has it they are still making it from my recipe! Here’s my lovely Butterball, which tasted so good! We enjoyed the dinner – me especially, since I didn’t get to cook or eat a Thanksgiving dinner last year. And I love cooking for someone else. We ate too much then retired to the living room to watch Chevy Chase in “Christmas Vacation.” It was as close to a traditional Thanksgiving dinner as I could get over here this year. What fun! Yum – everything looks good enough to eat! I love the idea of using a leftover baguette for the stuffing. A job well done! What an adventure! Next year give me a yell and I'll send you some ingredients so you don't have to make everything from scratch. (like the spices). Looking forward to Christmas dinner! RR, You've always been so good at improvising! Next time try pecans in the stuffing– much smoother than walnuts!